May 5, 1992 marked the release of the videogame for MS-DOS “Wolfenstein 3D”, a milestone in the field of videogames created by id Software and published by Apogee Software. “Wolfenstein 3D” is a FPS, meaning that it’s played from a first-person perspective so the experience of the action takes place through the eyes of the protagonist. In this case, the player takes the role of William “B.J.” Blazkowicz, an American soldier who during World War II must escape from Nazi Castle Wolfenstein when he was imprisoned. The escape is just the beginning of a series of missions that include the recovery of various treasures. Initially, the player has a gun with only a limited amount of ammunition and a knife that belonged to the prison guard but in the course of the missions he’ll find other guns and ammo packs. To heal the wounds he surely will suffer he’ll find food and medical kits. Obviously, during the various missions that must be completed in sequence, the player will face many Nazi soldiers as well as guard dogs and even mutant soldiers. To complete each mission, the player must find various keys that open some specific doors. Initially, the player has three lives but others may be won by earning 40,000 points or finding the token that allows you to directly earn one. The various levels contain secret doors that lead to more treasure and ammo. A secret level is also included. “Wolfenstein 3D” was released as shareware, meaning an edition limited to an episode called “Escape from Castle Wolfenstein” consisting of ten missions, that could be freely copied. Those who appreciated the game could buy the commercial version, which also included two other episodes titled “Operation: Eisenfaust” and “Die, Fuhrer, Die!”. Each episode is completed when the player manages to kill a boss which is an enemy particularly difficult to kill. At the end of the third episode, the boss is Hitler himself! 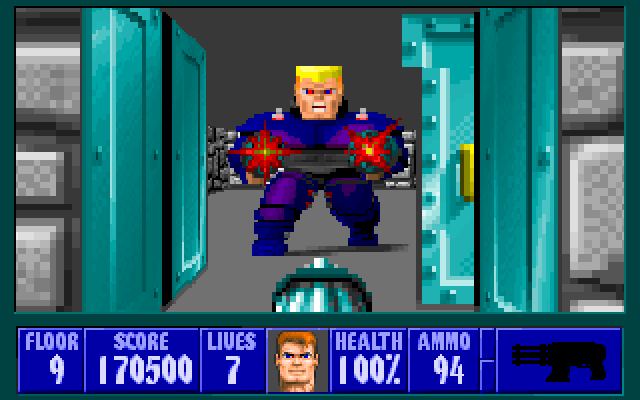 “Wolfenstein 3D” was an immediate success but was also controversial due to the use of Nazi symbols. In Germany, for many years its sale was forbidden. Later versions of “Wolfenstein 3D” included a “mission pack”, meaning three more episodes called “The Nocturnal Missions” whose individual titles are “A Dark Secret”, “Trail Of The Madman” and “Confrontation”. These episodes form a sort of prequel focusing on the Nazi plans for chemical warfare. Another separate prequel titled “Spear of Destiny” was released in September 1992. This game consisted of 21 missions that included two secret levels. In 1994 two mission packs were created titled “Return to Danger” and “Ultimate Challenge” consisting of 21 missions each however they had little success. Thanks to its success, “Wolfenstein 3D” was also brought to other platforms, including various game consoles. On July 21, 1995 the source code of the game was released by id Software, which instead retained control of the other game data. Despite its age, just last year the game was ported to Android. “Wolfenstein 3D” is a milestone that launched the FPS game genre. First-person games have existed since the ’70s but it wasn’t until the early ’90s that computers became powerful enough to provide a decent realism by adding a third dimension to the game. In 1991, id Software released the game “Catacomb 3-D”, the first truly modern FPS. 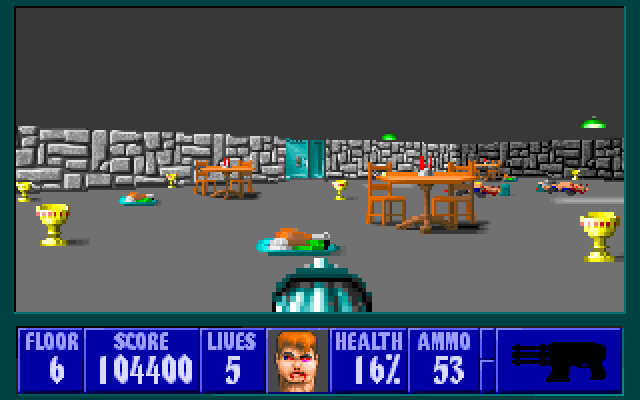 The game engine was enhanced to create “Wolfenstein 3D”, a sort of updated version to new technologies of the ’80s games “Castle Wolfenstein” and “Beyond Castle Wolfenstein”. The success of “Wolfenstein 3D” led to further developments of the graphics engine and the results were used in 1993 for the creation of another legendary game: “Doom”. In 2001 “Return to Castle Wolfenstein” was published, a reboot of “Wolfenstein 3D” that uses the graphics engine of “Quake III Arena”. In 2009 the sequel “Wolfenstein” was published, which uses the graphics engine of “Doom 3”. This series of games had a greater and greater realism to arrive, for now, to “Rage”, thanks to the constant computers power growth. Today, “Wolfenstein 3D” seems very primitive and not accidentally you can play it on a mobile phone. For me it was strange to play it again after so many years, for the record under Linux using DOSBox, but twenty years ago it represented the state of the art in the field of videogames. If today you can have a FPS with amazing realism it’s also thanks to the success of “Wolfenstein 3D”. Now you can play Wolfenstein 3D online as a browser game.